Stamina is one of the most important qualities needed for marathon running and other sports. It consists of a person’s ability to perform a physical activity for an extended period of time. Increased stamina improves your performance in a marathon and other long-distance events. Knowing how to improve your stamina will improve your running time while supporting your long-term health and wellbeing. The following are 3 things you can do to improve your stamina safely and successfully. Non-Running Training for Your Marathon It may seem counterintuitive, but activities such as swimming and cycling can improve your stamina when running. These activities reduce the impact forces that are applied to the joints and muscles when running. Although the body can adapt to the impact that occurs when running, an amount that overloads the body can lead to injury. Cross-training through the use of other sports is a way to improve your performance while giving you a break from running. Cycling and pool running have a high carryover effect, as their movements are similar those used in running. Increase Your Distance Gradually Runners must increase their distance over time as they prepare for a marathon. But increasing your distance too quickly can lead to unwanted issues. You need to give your body time to adapt to longer distances. Many runners use the 10 percent rule when training for a marathon. This rule states that the distance shouldn’t be increased by more than 10 percent of the previous week’s distance. You can apply this rule in your own program. But you also need to listen to your body. If a smaller increase begins to cause pain or other issues, you may need to reduce your increase for a given week. Gradual increases in distance are the best way to prevent injuries and improve your stamina over the long-term. Strength Training for Stamina Many runners avoid strength training out of the fear that it may slow down their performance. But there are many strength exercises that are beneficial to runners and improve their ability to recover from physical activity. Exercises such as squats, lunges, deadlifts, and pull-ups can condition the muscles and joints while improving cardiovascular endurance. Multi-joint (compound) exercises like these incorporate large and small muscle groups and improve functional strength and stamina. Overlooking the benefits of strength training can cause runners to experience issues related to chronic pain, decreased performance, and slow recovery times. These 3 things can improve your stamina when preparing for a marathon. Understanding how to increase your running distance, incorporate non-running aerobic exercises, and improving muscle strength will benefit your stamina. 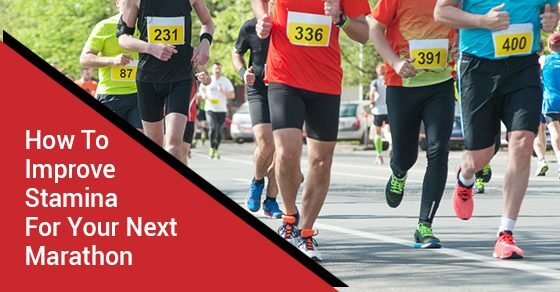 A physiotherapist or other health professional, who understands the unique needs of runners can implement the right program to help you achieve your running goals and improve your time for your next marathon. Excellent advice! Can’t stress enough the importance of consulting the experts at Physiomed when setting up a marathon program. Matt and his team at Milton Physiomed helped me build a strong program and through their multi disciplinary approach, provided a thorough physical assessment and strengthening plan targeting weaknesses/imbalances in my body. With their help, I ran 2:57:48 in Boston this year . Now working with them again toward a bigger goal heading back in 2018!